The Pound of Ground is a title faithful to its raw, meaty name... Do not expect over political correctness, do not look for complexity: your character is knee deep in trouble and the solution is rough, wild and decisive action. 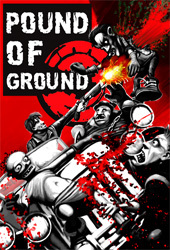 The game combines action elements – a wide range of finely tuned weapons, varying boss fights and grand, non-stop battles with swarms of undead – a strong story with many unexpected twists and peculiar characters. Very unconventional is the possibility to roam the Snake City in your own tuned super car, that may balance the odds in your favor for this battle of survival.